Englishman Tom Faiers went to a Graham Baxter training camp in Murcia when he was 18; as a triathlete, he wanted to strengthen his cycling. When he was training there, he ran into Spanish amateurs and pros; one day he met Alejandro Valverde and Luis Leon Sanchez, and stayed with them in the hills. Everyone else was dropped, and they encouraged him to race in Spain. Faiers found it really hard to start with; he didn't speak any Spanish and drove to races on his own, in his car, which he brought over from England. He stayed in Graham Baxter's house in Murcia for a while then rented an apartment there. 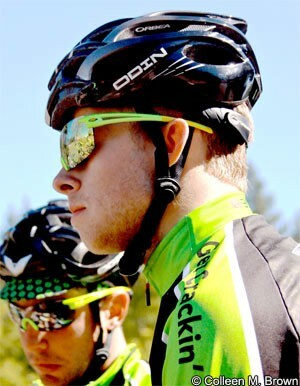 Improving over time, he rode for the amateur Fuenlabrada team in 2008 and then went to Camargo for 2009. He rated it a good set up, ranked fifth in Spain with a knowledgeable manager and a family-friendly feel to it. In the first two years he didn't ride a lot of races, as it was hard to enter races and get to them. But in 2008 he started to find his legs and had around 70 race days - including 10 tours. The breakthrough came in 2009 with eighth in the Vuelta Madrid; one of the biggest under 23 races in Spain. There were also strong top six places with three wins - the U23 Championship of Asturias, the Elite U23 GP Orgario and an elite U23 in Cantabria. But then things stalled; with a programme decided with the team which would be weighted towards the end of the season and include the Vuelta, a heart issue meant that the 23 year-old rider from Cheltenham’s pro career juddered to a stop. Originally Faiers thought that he would be a part of the Geox team for 2011 which will follow on where Footon-Servetto left off in 2010. 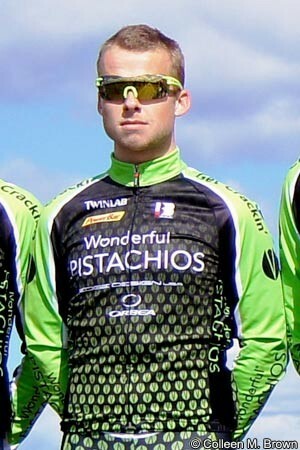 However, the phone calls and emails to management went unanswered and Faiers' agent, Robert Nichols moved quickly to secure his rider a new contract with US team, Wonderful Pistachios. VeloNation caught up with Faiers at his new base in Sacramento, speaking about the next phase in his professional career. VeloNation: First off, supraventricular tachycardia is the diagnosis with your heart, Tom – explain it to us, please. Tom Faiers: A heart runs on electrical signals. Sometimes my heart gets additional signals which cause it to race. There’s an operation which can be done but it would be very risky in my case. The condition isn’t dangerous...I’ve had all the tests done and it’s safe for me to race. It’s only ever happened to me twice in a bike race. VN: What did you do with all the down time at the end of last season? TF: A lot of time was spent just waiting on appointments with specialists; Footon didn’t want me to race until they were sure it wasn’t dangerous for me. VN: So no smooth move to Geox for you? TF: I thought I’d be on the team; but for one reason or another they never got back to me. I know it’s been a hectic winter for the team management but it would have been nice to hear from them. VN: Did you get many race days in 2010? TF: Not really, my programme was geared towards the end of the season; I was down for smaller stage races later in the summer - and the Vuelta. It was a big jump from being an amateur in Spain to riding races at Pro Tour level; I had to do lot of work for the team but I was handling it. Spanish amateur racing is very much a free for all, whilst the pros race in a very controlled fashion. The first year as a pro is about learning, in the second and third years you can start to think about specific targets. VN: How was the organisation? TF: It was OK, your flights were always booked and there was always someone to pick you up at the airport. But I had the feeling that it was like a Pro Continental rather than a Pro Tour team. There was a budget to think about, though, and they were really nice people. VN: Did you get paid on time? TF: Oh yes! There were no problems like that – Mauro Gianetti was a good guy, I have no complaints about him the way he treated me. The brand name belongs to Paramount Farms which is the largest grower and processor of nuts in the world. At races we ride they’ll be distributing snack bags of Wonderful Pistachios – like they do on the publicity caravan at the Tour de France. VN: How did you get the ride? TF: When it became apparent that Geox weren’t going to take me, Robert Nichols my agent, got to work with his US contacts; I’m not well known here and I only raced until last June so I was happy to get the contract. VN: What’s the programme looking like? TF: We’ll be doing the NRC programme, concentrating on North California races, particularly one day races – Philly for example - and crits. Crits are races I haven’t ridden a lot of, so I’ll have to see how they go. VN: Where’s home for you? TF: Sacramento – I’m staying here with my coach but the team is based in Santa Rosa. VN: Espana to California – that’s a bit of a change. TF: It’s different, for sure, but there just weren’t the opportunities in Spain. The economic crisis is bad there with very high unemployment rate and the money just isn’t there. I didn’t want to make a retrograde step back to a Spanish amateur team. VN: Are you a traditional or ‘hi-tech’ trainer? TF: I used to be a ‘miles man’ but now I’m much more into specific work – strength building at low revs for example. And I’m much more conscious now of things like lactic levels and watts per kilo. But that said, because I didn’t get any racing at the end of the season I did a big block of miles in November and I’m doing a lot of miles just now; I don’t want to peak until late March/April. I have good motivation but I’m aware that because there are fewer races in the US, I’ll have to train more than I did in Spain. TF: They want a lot of publicity from the crit scene – they’re a big company and if the team gets the results then the team could go bigger. VN: And Tom Faiers' goals? TF: I want to be fit, I want to race – I’ve had so many problems but I know that if I get the fitness I’m capable of then I can perform well. I’m particularly looking forward to the NRC stage races. TF: Europe’s where the big races are – but I’m not thinking about that, I’m focussed on success, here. But yes, one day it would be nice to race back in Europe.